These earphones are simply amazing. If you can overlook the practical issues of keeping them safe; if you can afford the hefty asking price; and if you love pristine sound quality, these things are the luxury-purchase you've been saving up for. There is something very special about the first time you test super awesome new audio gear. You know what I'm talking about - it's the way sound washes over you like a lake of narcotic syrup. It flows down your ear holes and intoxicates your brain. The music takes over your entire consciousness - you smile, and before long you're beaming from earbud to earbud and you can't stop. You want to stay in that moment forever. Stuffing your ears full of ACS earphones for the first time is one of these magical musical experiences. I'll certainly never forget it. I'm almost jumping from pure joy right now as I mainline CHVRCHES directly into my temporal lobe. Trust me, these things are incredible. So we've established that these earphones are special, so let's take a couple of steps back and address the elephant in the room. Yeah - they cost £649 in the UK and $999 in the US. Bosh. Yes, that's six hundred and forty-nine English pounds, nine hundred and ninety-nine US dollars. The expense comes from the delicate, intricate, painstaking process of construction, the man hours spent making them and the high quality components used. Custom molded especially for your own ears and your ears alone, the price includes the cost of having ACS personally take a mold of your lugholes. The fitting process is like this: your ears are examined. You'll need to make sure they're not blocked with wax or the fitting cannot continue. Tiny tampon-like objects are then inserted deep into your eardrums with string poking out the top for easy extracting. Liquid silicone is then piped in until it sets. This is your first taste of the noise isolation that glove-fit silicone can offer - it's a strange sensation and adds to the special experience of getting your own ACS earphones made. The mold of your ear is then popped out and taken away. The ear tampons can now be discarded (or kept as fun souvenirs). 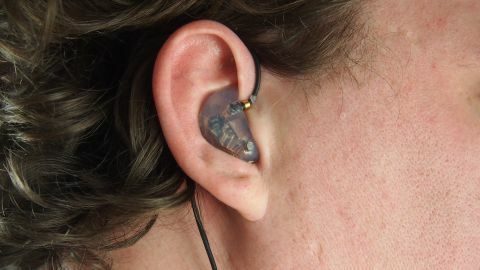 ACS will then go away and manufacture a pair of earpieces from transparent medical-grade silicone. Inside the buds sit a motherboard with three audio drivers each pumping out a different range of frequencies. Like a ship in a bottle, you'll wonder how it all got in there. You can even have custom text printed onto them. I chose to have my @Rungsberry twitter name on the side but you might choose something more sensible (I dunno, like your actual name or something). The earpiece sits flush with the outside of your ear so they don't stick out, and the shaft extends right down to your eardrum to ensure a perfect acoustic delivery mechanism. This is oldschool analogue sound engineering at its mightiest. It's certainly the best way of injecting high quality audio into your brain, and that's why professional musicians use ACS T1 Live! earphones as their monitors-of-choice. If you've seen the likes of popular UK boy sensation One Dimension or the American chart-topper Lady Baa Baa wearing snazzy earpieces during their performances and wondered what they were, well, these are they (the units I tested were the Live! models but without the additional microphone assembly, effectively making them the slightly cheaper non-Live model). Noise isolation is the best I've ever experienced. You can be in a room with a lot of noise – talking, shouting, laughing, music, clapping, phones ringing – and you'll hear almost none of it even without having any music on. That's why ACS also make custom... earplugs. I appreciate excellent sound quality but I'm not above MP3 compression – 320kbps is plenty good enough for my tastes. And as such, Spotify's 320kbps OGG music sounds absolutely amazing through the T1. However, the ACS T1 expose the limitations of compression like no other earphones I've ever tested. Fire up some lossless FLAC tracks and you're immediately submerged into another dimension of colour and contrast. The output is very flat. There's no bass-boosting shenanigans at play here. The idea is to hear the source with as much clarity as possible, and that's why triple drivers are used. This is not 'Beats by Dr. Dre' audio perfection - this is actual audio perfection. You'll hear artists breathing and wonder why you never noticed it before. You'll detect new instruments in a mix and swear they weren't there last week. Listening with these things is like looking down into a crystal-clear sonic lagoon with the most beautiful coral reef at the bottom and then diving in and swimming with psychedelic multi-coloured turtles (magic rainbow turtles from the planet Jazz). But while they sound phenomenal, they're not the perfect consumer product, and this is why it's not a straight forward TechRadar recommendation. If you're using conventional earphones at the moment and generally stuff them in your pockets when not in use, you're going to have to change your ways if you splash out on a pair of ACS T1s. They're hand crafted. They're delicate. If you mistreat them, you will break them. This is why the T1's come with their own ruggedised carry case. In it, you get a leather-like carry pouch, cleaning prongs, ear balm, and some replacement components. (Yes, ear balm). Use the case or you'll regret it. The buds are so large that they get instantly mega-tangled whenever you put them down. And I mean tangled like no other headphone cables ever. I've spent entire weekends trying to untangle these things, you have to be so careful with them. Because of this, it's hard to recommend these earphones for out-and-about listening. You can't throw them in, pull them out and toss them in a bag. You will ruin them if you do that. And so they're far more suited to home (or let's be honest, studio) listening when you have time to sit and enjoy their sonic majesty. This instantly rules out a huge swathe of potential customers, but that's the price you pay for the best. It also makes this product particularly tricky to score. You'll also note there's no in-line clicker - so no easy-access play/pause/skip button which is a bit of a drag for anyone used to the convenience of Made for iPhone. If you've got the cash and you love pristine sound quality, you should buy these things straight away. However, the practicality issues make them unsuitable for most people. I've stopped using them on my commute in the mornings because they're fiddly to get in and out and too delicate to take everywhere I go. If you're happy with the practical issues of using them, though, and you don't mind shelling out a thousand bucks for the best audio experience you've ever had, what are you waiting for?